Labels: fashion, j crew, jewelry, outfits, photos by d.
That just looks gorgeous - the blue against the gold. I don't have a blue denim shirt though I did buy one last year but returned it as it wasn't the perfect fit. Perfect colour, perfect fading but not perfect fit. I love the minimalist looks too but I can't do fastened up collars without feeling a bit choked and also because I have a short neck so I nearly always wear my shirts and blouses with the collars unfastened. And yes it's nice to have a peek at a little bit of jewellery - love the little apple! It's oddly hard to find a good denim shirt actually! This one from J Crew is chambray, but it's a little heavier than your usual chambray, while still being lighter (and easier to wear) than actual denim. I have good luck with J Crew button-downs in general, have you tried them? The apple was a gift from my aunt when I was born, and still one of my favorite pieces of jewelry to date! The denim contrasted with the gold looks wonderful, and there's never anything wrong with a Texas tuxedo - it's all in how you wear it! And I think it's safe to assume you looked quite chic. Quite the assumption! Ha ha.. But thank you, I appreciate your confidence. 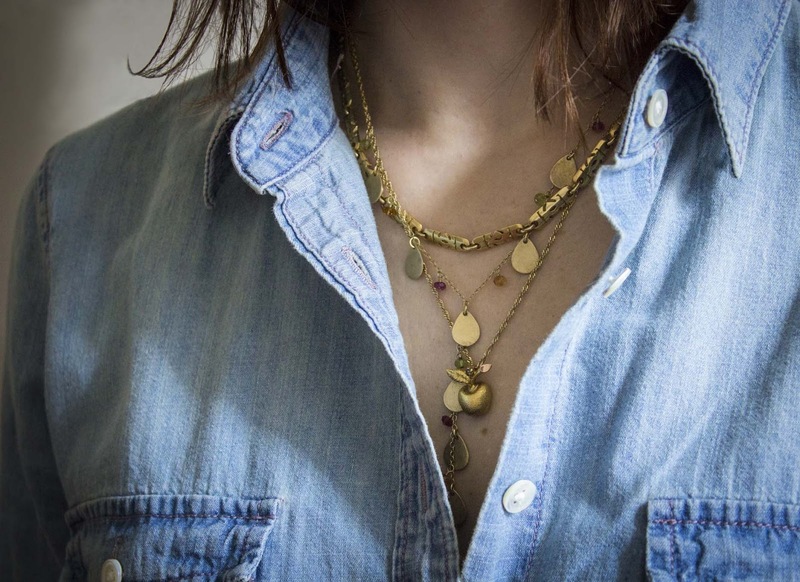 Love the contrast of the denim shirt and the golden necklace (which, by the way, is super cute). Thank you, it's actually three necklaces layered, I felt like I needed the combination of weights and textures. Love the denim with expensive or statement jewelry! Love this!! And the necklace is so pretty!